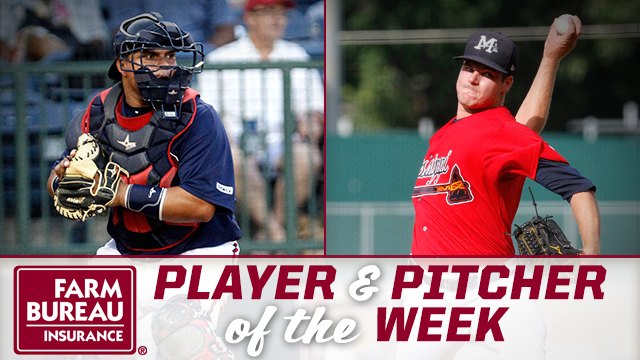 PEARL, MS -- Catcher Willians Astudillo and RHP Jason Hursh have been named Mississippi Farm Bureau Player and Pitcher of the Week for the week ending Sunday, May 8. Astudillo, 24, posted a .389 average and a .556 slugging percentage in five games during the week. In 24 games with the M-Braves this season, the catcher has a .279 average with four doubles, a homer and 14 RBI. He's struck out just twice in 86 at-bats on the season. A native of Venezuela, Astudillo was signed as a free agent by the Atlanta Braves on November 24, 2015. Hursh, 24, did not allow a run in three relief appearances for the M-Braves this week. He surrendered just one hit in 5.1 innings of work, holding opponents to a .071 average. After giving up two earned runs in his first two outings of the season, Hursh has allowed just one earned run in his past nine outings-a 0.67 ERA. The right-hander was selected by the Braves in the first round of the 2013 draft out of Oklahoma State. The Double-A Braves start a five-game series against the Mobile BayBears tonight (May 9-13) at Trustmark Park before heading back out on the road for 10 games while Trustmark Park hosts the Mississippi High School Activities Association State Baseball Championships May 17-21.